Leo is now 2years and 10months (July13). This is due to his lack of mobility and funding for special equipment at playgroup. 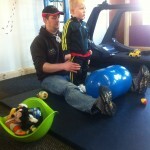 Leo is working extremely hard with his therapies and exercises at home. We are very proud of his determination! 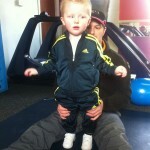 He has recently built up the strength to sit up (unaided) and step (aided). This is a huge achievement thanks to Mpfitness, Leo’ s playgroup one-to-one (Nicola) and his willingness to learn. He is such an inspiration. He makes his Mummy and Daddy feel very blessed to have such an amazing bundle of joy!!! To date we have raised £44,000! eek…not far off now!!!!!!!! LEO is now 2years and 4months (Jan13). He has recently started play school were he goes every morning for 2 1/2 hours. The results from the therapy were amazing. 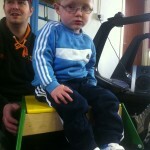 Leo can now sit on a stool, cross legged sitting and sit low knees.